I walk into Forever 21, and I’m instantly overwhelmed by signs advertising “50% Off”, “Buy One Get One Free”, and “SALE.” The store is filled with bright colors, fun designs, and posters of seemingly perfect people. I turn to my right and the wall is covered with the image of three beautiful girls on a road trip laughing together while wearing perfect outfits. The environment is energizing and tempts me to buy everything in the store. If the signs and advertisements aren’t enough, the price tags surely are. Forever 21’s clothes are so inexpensive, they almost seems too good to be true… and maybe they are. A documentary called The True Cost is an eye-opener to the corruption of the fashion industry. In particular, the “fast fashion” industry. Fast fashion refers to stores like Forever 21 who make cheap, low-quality clothing. They are constantly coming out with new looks and trends that encourage consumers to buy more and more. While cheap clothing may seem nice, there are hidden costs that have nothing to do with the price tag. The production and consumption methods created by fast fashion companies are unsustainable and fueled by unethical practices. Your low price tag is someone else’s low standard of living. After hearing the cruel and destructive acts of many fashion companies, I know I should no longer buy their products, but with deals so good, it’s hard to stop. I’m in forever 21, and I’m looking through the racks when a grey long sleeved shirt with flared sleeves catches my eye. I look at the price tag and see the cost is only $8.99; now I really like it! I am tempted to buy the shirt, but the price tag makes me wonder how the cost could be so low. The tag reads “Made in the USA”, which seems odd, as most cheap clothes are produced outside of the United States, in countries where workers are underpaid and work in unsafe conditions. It turns out Forever 21 has found a way to produce the same way here in the US. According to the LA Times, a shirt like this grey long sleeve was most likely manufactured in a factory just outside of LA. The workers involved in its production were very likely paid around $6.00 per hour and worked long days in sweatshop conditions. After a hard day of working in poor conditions, they return to their cramped apartment. That is, if they are fortunate enough to own a home, or can afford to rent an apartment. With these low wages, it is a struggle for most workers to make ends meet and support their family. So how could this happen in the United States? Although it’s illegal, Forever 21 has found a way to drop their responsibility for the situation through a complicated series of middlemen and loopholes. For example, they’ve made the claim they’re a retailer and not a manufacturer, which reduces their responsibility for the workers. I want the $8.99 shirt, the price is so low and I would wear it all the time, but how can I bring myself to buy it after knowing people were mistreated in the production process. Unfortunately, Forever 21 is not the only company at blame. I walk into another store and instantly see a colorful, flowy blouse I love. The price is only $14.99. At such a cheap price, why wouldn’t I buy it? The tag says it was manufactured in Bangladesh. I think back to the documentary and the story of a young mother who went to work every day in a factory that looked as if it could crumble to the ground at any moment. After a hard day of work she would earn approximately $2.00, hardly enough to support herself and her young daughter. In the end, she had to send her daughter away from the slum she lived it to a nearby village to live with family. Although she was heartbroken to be separated from her child, she wanted her daughter to have a better future and get the education she never could. Now, when I look at this shirt all I can think of is the suffering the workers went through just to create this product. While I really want this shirt, I can not bring myself to purchase it. I go to the final store, hoping to finally find something I can buy. I pick up a navy blue knit sweater, and I’m hoping this will be the one. I check the tag to find the cost is $17.99, which is inexpensive for a sweater. The tag in the back reads, “Made in Cambodia.” I think about the Cambodian garment workers protesting in the streets, and the violence they faced in their attempts. All they were asking for was $160.00 a month. They simply wanted a fair and dignified wage for the hard work they do, yet five workers were killed while protesting. I love the sweater, but I can’t buy it. This has become the trend every time I shop. I can’t look at my closet without feeling shame and guilt. I think about all the clothes I bought and didn’t truly need, and it makes me sad to know the negative impact the manufacturing process has had on people’s lives. Knowing all these facts about the damage our consumption creates, it’s hard to shop without feeling guilty. I feel so much conflict when I find something I love from a brand I could never support. Fortunately, there are some ways to shop guilt free, or at least to reduce the negative impact of your purchase. Shop from ethical brands. Brands like People Tree, Patagonia, and Everlane create clothing produced ethically and sustainably. 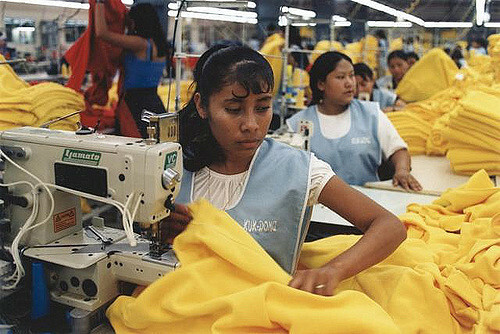 While they may be more expensive, their clothing is fair trade, and there is no need to feel guilty about the damage your clothes may be doing to the workers who made them. Make sure the clothes you buy are good quality and something you intend to wear for a long time. Buy clothes that will last so they don’t have to be thrown away after only a few uses. Shop second hand. Not only is shopping at thrift stores and consignment shops an affordable way to get some cool clothes, it’s also environmentally friendly as clothes that would otherwise be thrown away are now getting re-purposed. Remind yourself that new clothes won’t improve your life. The companies creating the advertisements sell the consumer the illusion of a picture perfect life. While it would be great if happiness was that easy to find, that’s simply not the reality; in fact, professionals have suggested it’s actually causing the opposite effect. Think about the impact. Is that $5.00 shirt still something you want after you know it was made by an impoverished Indian sweatshop worker? Think about the life behind that piece of clothing, then decide if it’s still worth buying. The way the Forever 21 produces their products is dangerous and unfavorable. However, the business itself provides people with jobs. Although the conditions are not up to standard and the process that workers endure is tedious, they do get compensated with some cash to provide themselves with the bare necessities. It’s really just two sides of the same morality coin. Do we put people out of jobs for better products? The narrator of The True Cost challenged us to be better.